Successfully Added Monitor Buddy - Wireless Widescreen 7 Inch LCD Baby Monitor with Night Vision Camera to your Shopping Cart. Baby Monitoring has never been so advanced with this convenient Monitor Buddy - Night Vision Wireless 7 Inch LCD Baby Monitor. There is nothing more important to you than your child's safety and security. You want to be with them night and day to know that they are safe at all times. But with so much to do around the house in a normal day, you know that it isn't always possible. With this Wireless Baby Monitor, you finally have the freedom to watch TV, entertain guests, do household chores, exercise, and even sleep with the peace of mind that you will always know when your baby needs you. With a large 7 Inch Screen, the Monitor Buddy Baby monitor gives you a bigger and clearer image than many of the small LCD Monitors where you can’t see the baby perfectly. Designed specifically with you and your baby's needs in mind, the Monitor Buddy Wireless Baby Monitor includes 8 infra-red lights for night vision that will automatically go to work and provide a nice bright view of your baby. Check on the little ones without the risk of waking them up, since all you need to do is take a quick glance at the baby monitor to know that your precious one is sleeping as well as you are. Easy to set up, just plug in the camera and monitor, switch on the monitor and choose the right channel, then the system is ready to use. You will immediately see what the camera sees on the LCD screen. Why would you buy a baby monitor set that can't also grow with your family? The Monitor Buddy Wireless Baby Monitor is compatible with up to 4 cameras through 4 wireless channels, as your family grows; this Baby Monitor can expand right along with you. Have a camera in the baby's room, living room, play room, or even pointing at the front door. This monitoring system can be used for not only baby care but in a car park, garden or anywhere around the home for security. 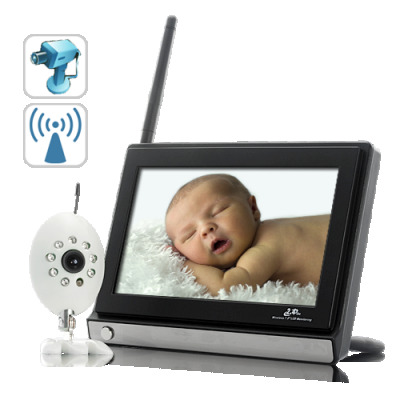 An advanced large screen baby monitoring solution, the Monitor Buddy Wireless 7 Inch LCD Monitor is not only great for monitoring babies but also for general wireless security monitoring also. With people more focused on security and a busy lifestyle, this monitor is sure to be in great demand. This is a deal you don’t want to miss. Don’t delay, place your order and we’ll ship it out tomorrow, from your favorite source for high tech electronic goods, Chinavasion. Very Good choise for a camera.